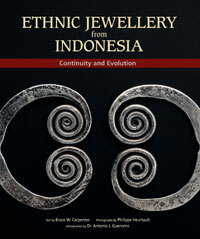 Ethnic Jewellery from Indonesia: Continuity and Evolution is a compelling introduction to the little-known and visually-powerful body adornments of the ethnic peoples of Indonesia's outer islands, including Sumatra, Borneo, Sulawesi, Sumba and Maluku. The history of the jewellery is told from the perspective of the materials used, including gold, silver, brass, ivory, shell and animal teeth. Illustrated with nearly 600 photographs of rare jewellery amassed over 30 years by collector Manfred Giehmann, this book explores the depth and breadth of an ancient and magnificent tradition of the Indonesian people. It will provide information on the origin, meaning and purpose of the jewellery, as well as unique insights into the people who crafted and wore the jewellery for ritual or ceremonial functions. Ethnic Jewellery: Continuity and Evolution is a definitive work on the subject and a testimony to the living traditions of cultures usually shrouded in mystery. You can order the book from our Amazon.com store, under Jewelry category.